I am delighted to introduce Roxy, a delightful disco boogie, wearing one of my thistle flower tops. 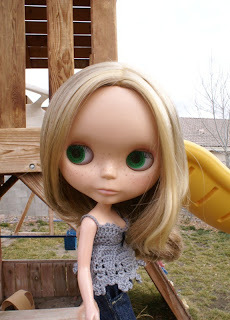 Her wonderful mommy Laura makes fabulous blythe goodies and takes marvelous pictures. Check out her flickr and etsy.com sites: http://www.flickr.com/photos/riffragz/ and http://www.etsy.com/shop.php?user_id=5304748 Thanks Laura!